Former Vice President, Chief Dr. Alex Ekwueme, Wednesday, assured of his fatherly support to the leader of the Indigenous People of Biafra, IPOB, Mazi Nnamdi Kanu. Ekwueme made the pledge when the IPOB leader visited him at his Enugu residence, with a promise that he would listen to advice from the elder statesman. Kanu has since he was released being paying thank-you visit to prominent persons and organizations, with a vow that he would never give up on Biafra. He had told Ekwueme that “I have come to tell you that we find you invaluable in our advancement of our people and in our course also to make life better for the public and for the masses. “So, I am humbled and delighted to be here and also to bring you up to speed as to what we have been doing, what motivated me; what motivated the IPOB to do what we have been doing. “It is more or less today an expression, a political expression to the yearnings and aspirations of the society; that’s what we are trying to do. 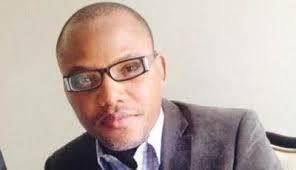 “The sum total of the struggle by the IPOB, which I’m leading is to ensure that there is dignity of life. “And for us to fulfill that very mandate, we must be diligent, we must be focused, we must be sincere. “I will make my best counsel available to him in his very onerous task of leading an organization that is committed to bringing justice and equity among people, especially for our people”, he added. DAILY POST recalls that the IPOB leader had on Monday visited several persons and groups in Enugu, including the Eastern Consultative Assembly, ECA. The former Vice President, Ekwueme, is a patron of the ‎ECA.